Ten-Ten, it was a day even the most experienced meteorologist feared to forecast. Northwest Florida prepared for a swiftly developing hurricane, possibly a category 4 even reaching a cat 5 level, threatening to bash some of the world’s most beautiful beaches. Some were scarred, some were spared and one we will not forget. Hurricane Michael was fierce and left a destructive mark on the natural landscape, a day the center of our region’s landscape was changed. With this being said, the other areas of the region remain intact in its natural pristine beauty, and welcome visitors. Coastal and inland communities in Walton, Franklin and sections of west Bay are delighted to receive visitors. The remaining sections of the region are in full swing with clean up and debris removal. Every day progress is made. We see the light and know the hard work of crews, volunteers, and organizations assisting us will get us back in business to welcome visitors to the rest of our region. The sunsets may yield a different view but the sight remains clear, Explore Northwest Florida is quickly rebounding and will soon see the sun shine even all meteorologist will accurately forecast. 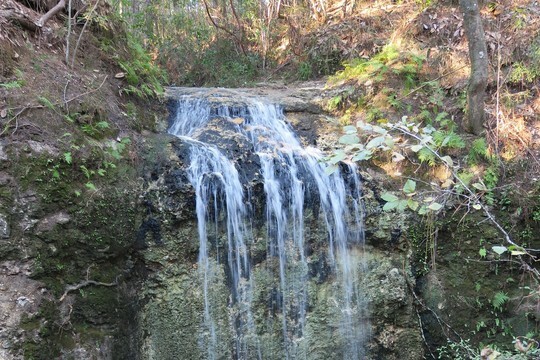 Visitors can once again see Florida’s highest waterfall at Falling Waters State Park. CHIPLEY, Fla. – The Department of Environmental Protection’s Florida Park Service has reopened portions of Falling Waters State Park for day use following the impacts of Hurricane Michael. The park, which experienced significant damage from Hurricane Michael – including downed trees and debris, facility, boardwalk, road and trail damage – was partially reopened late last week following three weeks of clean-up and repair. Visitor safety remains paramount as response efforts continue. Florida State Parks staff continue to work as quickly as possible to finish remaining clean-up and repairs. Amenities and access to certain areas of the parks may be limited until the work is completed. Of the 31 state parks impacted by the storm, only seven parks remain closed. Guests can enjoy the beach at St. Andrews State Park, cruise the river at Edward Ball Wakulla Springs State Park and explore the gardens at Alfred B. Maclay Gardens State Park. Falling Waters State Park features Florida’s highest waterfall, which cascades down 73 feet to the 100-foot deep Falling Waters Sink. Now that the park has reopened, visitors can once again observe this amazing natural resource. Find a Florida State Park near you and plan your next visit. The Florida Park Service is the proud recipient of three National Gold Medals for Excellence in Park and Recreation Management, making Florida America’s first three-time Gold Medal winner. The awards were received in 1999, 2005 and 2013 from the American Academy for Park and Recreation Administration and the National Recreation and Park Association. Florida’s 175 state parks, trails and historic sites inspire residents and visitors with recreation opportunities and scenic beauty that help strengthen families, educate children, expand local economies and foster community pride. With nearly 800,000 acres, 100 miles of beaches and more than 1,500 miles of multi-use trails, residents and visitors should plan to visit soon and often to enjoy Florida’s natural treasures. Download the Florida State Parks Pocket Ranger® mobile app, available on iTunes and Android Market, to plan your trip and enhance your experience. For more information, visit www.FloridaStateParks.org. Marianna resident Pam Fuqua has taken over as president of RiverWay South at a time when the organization has embarked on a “rebranding” mission. It’s keeping its name but also will be more publicly doing business as Explore Northwest Florida. Feel free to read, to laugh with me, to cry when appropriate, and to, as Lil’ Abner (whom I quote often) says “angrify” if it fits. I grew up in Chattahoochee, Florida, a small town that overlooks the confluence of the Chattahoochee, Flint and Apalachicola Rivers. The Florida State Hospital is there. It had once been a fort in the time of the American Civil War. The largest employer, other that the Hospital, was Florida Gravel Company.